"The attached drawing comes from Sun Lu-T’ang’s earliest version (1912) of his published book 形意拳學 Xingyiquan Xue (The Study of Form-Intent Boxing) which was later revised and republished in (1915) using photos of Sun Lu-T’ang. radical parts, and to the teachings of her father and Master Guo. Therefore, 三體式 San-t’i Shi can, in part, be translated as: Three Embodiments Posture; Three Substances Posture; or Three Essentials Posture. It is safe to say that collectively, these three translations of 三體式 will bring you closer to understanding its inclusive meaning. I have chosen to use ‘embodiment’ as the fore fronting translation based upon clarifications presented by both Madam Sun and Wang Xi-Kui (Sun Lu-T’ang’s disciple). The meaning of Pine and Crane as part of this posture is explained below as passed down and taught within the Sun family by Sun Lu-T’ang’s teacher, Guo Yun-Shen. ‘三體式 San-t’i Shi (Three Embodiments Posture) embraces more than the tip of the nose, tip of a finger, and tip of a toe, the 三 san (three) which form a ‘single alignment.’ These are not the only three tips that are aligned, there exist both the upper and lower and front and back, each containing three tips that are to be aligned during xingyi boxing postures and sets. Beyond such tips exist further teachings essential to San-t’i Shi as well as all postures. To begin, one must understand 伸展 shenzhan (to stretch). 伸展 Shenzhan is the unity of both 伸 shen (to extend) and 展 zhan (to spread outwardly) in a manner that evokes forward extension with sideward spreading like the wings of a 鶴 he’r (crane). Both physical actions are slight, yet their intent is great. When these two actions unify 伸展 shenzhan becomes the ability to ‘stretch’ in a manner strictly adhering to ‘extending’ and ‘spreading.’ However, 不用力 buyongli (no physical exertion) must be followed. The practice of xingyi boxing must be done so in a relaxed manner physically. Internal softness with only the appearance of external strength is essential. 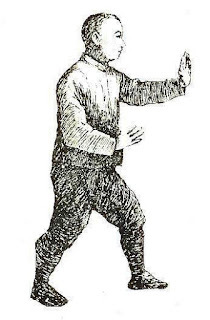 Once attained then the skill of 撞擊 zhuangji (ramming strikes) fuse within all hand and foot attacks. This is one’s ability to have each hit contain the force of a battering-ram, each possessing 擊力 jili (striking power) able to collapse a wall built of stone. Such must be coupled with 突擊 tuji (to suddenly attack) without warning and with great ferocity that must not be seen upon one’s face. Note from Bradford: The character 鬆 song means to loosen and relax. However, it also refers to a Pine tree which is symbolic of long-life and often the wisdom that comes with a long lifespan. 鶴 He is the character for Crane, also symbolic, in this case, for longevity. Paired, 鬆鶴 Song He refers to a person who will live as long as the Pine and Crane nestled among the Tao. Further information on 三體式 San-t’i Shi and related teachings by masters Guo and Sun are found in my books www.amazon.com under Bradford Tyrey."